Bringing a postcolonial perspective to UK constitutional debates and including a detailed and comparative engagement with the constitutions of Britain’s ex-colonies, this book is an original reflection upon the relationship between the written and the unwritten constitution. Can a nation have an unwritten constitution? While written constitutions both found and define modern nations, Britain is commonly regarded as one of the very few exceptions to this rule. Drawing on a range of theories concerning writing, law and violence (from Robert Cover to Jacques Derrida), Constitutions makes a theoretical intervention into conventional constitutional analyses by problematizing the notion of a ‘written constitution’ on which they are based. Situated within the frame of the former British empire, this book deconstructs the conventional opposition between the ‘margins’ and the ‘centre’, as well as between the ‘written’ and ‘unwritten’, by paying very close, detailed attention to the constitutional texts under consideration. 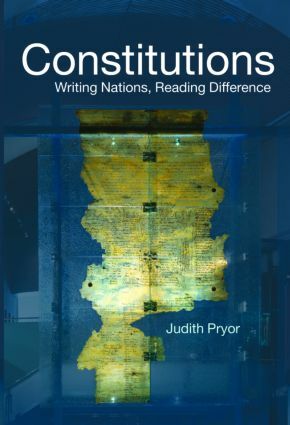 Pryor argues that Britain’s ‘unwritten’ constitution and ‘immemorial’ common law only take on meaning in a relation of difference with the written constitutions of its former colonies. These texts, in turn, draw on this pre-literate origin in order to legitimize themselves. The ‘unwritten’ constitution of Britain can therefore be located and dislocated in postcolonial written constitutions. Constitutions is an excellent addition to the bookshelves of all students of the philosophy of law, political theory, constitutional and administrative law and jurisprudence.